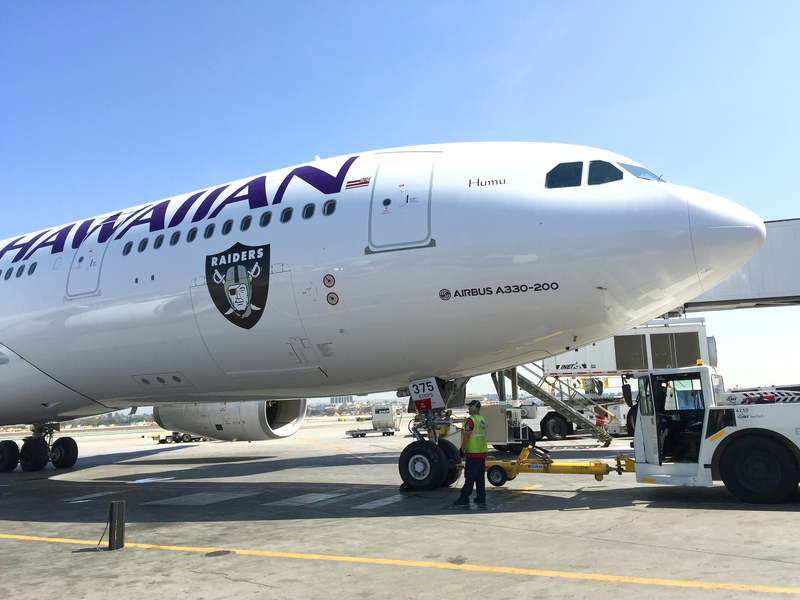 HONOLULU – Hawaiian Airlines is proud to announce it will serve as the Official Airline of The Oakland Raiders for the 2015 National Football League (NFL) season. 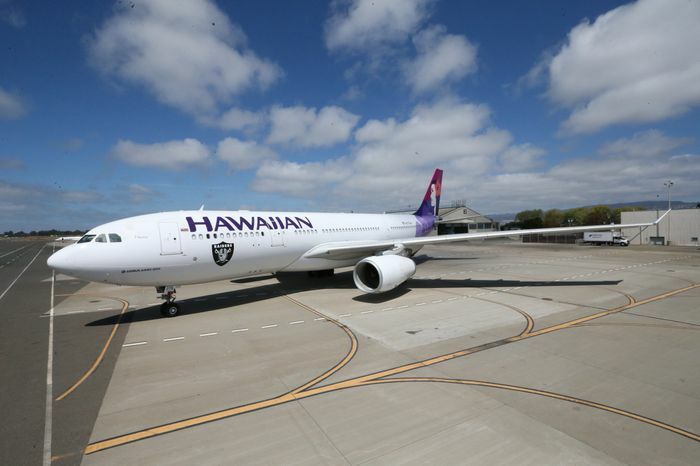 Hawai‘i’s largest and longest serving carrier has provided its signature ‘Mea Ho‘okipa’ (translation: I am host) in-flight hospitality and charter service for the team’s away games since 2000. A Hawaiian Airlines A330 sporting the shield of The Oakland Raiders. Starting with the Raiders’ Sept. 3 preseason game against the Seattle Seahawks, Hawaiian’s designated Airbus A330 aircraft featuring the Raiders’ shield will carry players, coaches, trainers, as well as uniforms and equipment, to eight games, including: Seattle, Cleveland, Chicago, San Diego, Pittsburgh, Detroit, Tennessee and Denver through December. “Hawaiian pairs a winning combination of unmatched comfort with excellent service and they are dedicated to helping the players and coaches get ready for football,” said Raiders President Marc Badain. Hawaiian provides a dedicated catering coordinator to meet the team’s expectations and to handle special requests. Hearty, nutritious meals are provided along with sandwiches and an assortment of healthy snacks that include fresh fruit, protein bars and, at the Raiders’ request, products from Hawai‘i, such as Passion Orange Guava Juice and Hawaiian Iced Tea. For entertainment, Hawaiian offers a wide selection of movies, TV shows and music. Hawaiian Airlines has served the Oakland market since 2008, and provides daily nonstop flights to both Honolulu and Kahului, Maui. During the peak summer months, travelers can fly nonstop to all four major Hawaiian islands, when the airline adds seasonal service from Oakland to Līhu'e, Kaua'i and Kona, Hawai'i Island, between May and September. 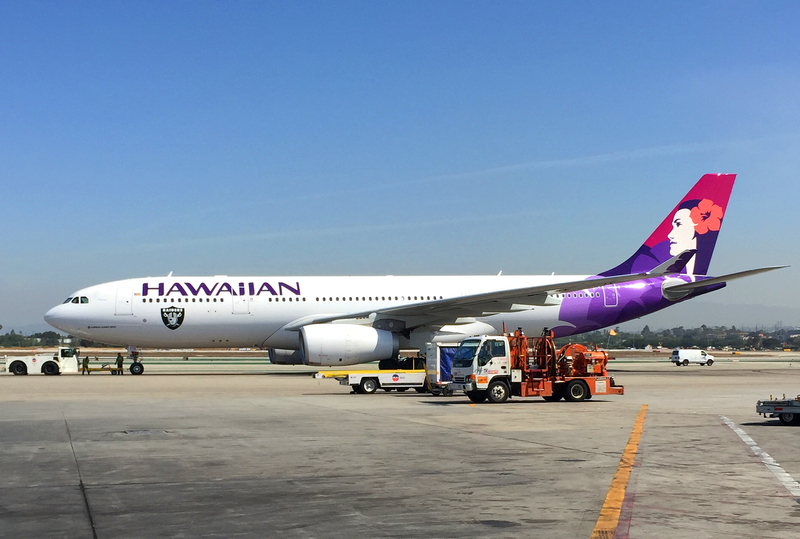 Hawaiian also serves the Bay Area with nonstop flights between San Francisco and San Jose to Honolulu. 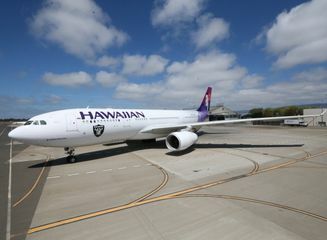 A Hawaiian Airlines A330 aircraft featuring The Oakland Raiders' shield will carry players, coaches and trainers to eight away games during the team's 2015 NFL season. 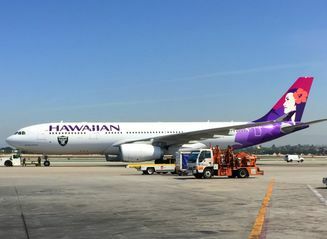 A Hawaiian Airlines Airbus A330 featuring The Oakland Raiders' logo. Photo courtesy of Tony Gonzales, Oakland Raiders.